Brenda Gail Slaughter, age 62, of Jackfork Road, Rockholds, Kentucky departed this life on Tuesday, January 22, 2019 at the University of Kentucky Medical Center in Lexington. She was born on August 14, 1956 in Cincinnati, Ohio to the late Frank and Ruby (Gibbins) Vanover. She was also preceded in death by her son, Donnie Ray Slaughter and three brothers, Tommy Eugene Vanover, Jackie Vanover and Larry Vanover. 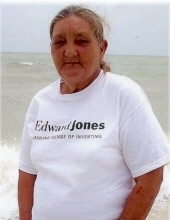 She is survived by her husband, Leonard Jessie Slaughter of Rockholds; children, Leonard Jessie Slaughter Jr. of Rockholds, Tammy Manriquez (Alvaro) of Rockholds, Tommy Slaughter of Corbin, Jessica Slaughter and husband Clinton Gearheart of McArthur, Ohio and Crystal Calvillo (Nelson) of Rockholds; 20 grandchildren; one great grandchild; six sisters, Linda Phyllis Nichols of Rockholds, Glenda Ann Meadors of North Carolina, Connie Kate Vanover of Williamsburg, Betty Bowling of Williamsburg, Sherry Mills of Williamsburg and Dessie Kidd of Rockholds; two brothers, Frank Vanover of Williamsburg and Jessie Vanover of Louisville; several nieces and nephews; and a host of other family and friends to mourn her passing. Visitation will from 10:00 A.M. Monday, January 28, 2019 at Croley Funeral Home. The Funeral Service will be at 1:00 P.M. Monday, January 28, 2019 at the Croley Funeral Home Chapel with Rev. Greg Medlin officiating. To send flowers or a remembrance gift to the family of Brenda Gail Slaughter, please visit our Tribute Store. "Email Address" would like to share the life celebration of Brenda Gail Slaughter. Click on the "link" to go to share a favorite memory or leave a condolence message for the family.